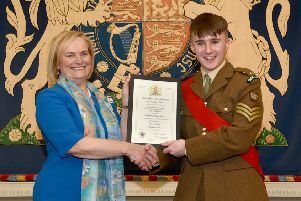 The newly appointed Lord Lieutenant's Cadet for the County of Londonderry, pictured receiving his award certificate from Mrs Millar is Cadet Sergeant Ethan Wilson, an enthusiastic and high-achieving member of the Newbuildings Detachment Army Cadet Force. The 16-year-old Cadet Sergeant can look forward to a busy year ahead as he attends Mrs Alison Millar, Her Majesty’s Lord Lieutenant for the County of Londonderry, on major civic occasions. Ethan, a student at Foyle College, is described in his award citation as “a mature and self-reliant young man who has always been keen to progress throughout his cadet career”. Since joining the Cadets four years ago he has proved a committed and enthusiastic asset to his detachment, quickly establishing himself as a role model for younger cadets. He rarely misses a detachment night, and has attended three summer camps in England, and a junior Easter camp in Magilligan. He helps raise money for charities such as the Royal British Legion and has paraded at every Remembrance Sunday since he joined the ACF. Last year he successfully completed his Senior Cadet Instructors’ Course and he is currently working towards the Duke of Edinburgh Silver award. Ethan has ably represented the company in military skills and first aid competitions and last year competed in the Inter Battalion competition for rugby, demonstrating his determination to make the most of his Cadet experience and to become wholly involved in all activities available to him. Ethan has developed a considerable flair for first aid during his cadet career, earning accolades at Battalion, Regional and, most recently, National level. In September 2018 it was announced that he is to be awarded the BAE Award for Excellence in First Aid for his hard work and dedication – a fantastic achievement which was marked with a trophy presentation at the annual Army Cadet Force Association Dinner in London. Fuelled by success, Ethan has proved eager to share his enthusiasm for Cadet life and is credited with bringing thirteen new recruits to his Detachment, following a presentation ha made at his local youth club where he is a volunteer helper. 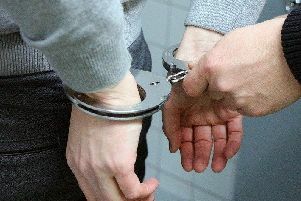 The Citation concludes: “Cadet Sergeant Wilson has achieved much for someone so young, yet he manages to juggle cadets, school, and his personal commitments without complaint. “His positive attitude and pleasant nature shine through continuously.